Relief Wrap™ | Heat Therapy for Your Shoulders, Neck & Back! Your Shoulders, Neck & Back! Neck, Back & Shoulder Tension! Surround You With Warm, Soothing Comfort! Relief Wrap™ increases blood flow to the sore areas of your body causing muscles to relax and healing to happen faster. It helps loosen muscles, soothe achy joints, reduce swelling, stimulate blood flow and work away stiffness and tension. The 2 heat settings let you customize your therapy based on the level of intensity you need to start feeling better! Relief Wrap™ 4 massage settings get you the perfect level of intensity to maximize results! Simply turn on Relief Wrap™, choose between High & Steady, Lo & Steady, High & Pulse, Low & Pulse, and massage directly on the areas you feel of stress and strain for maximum relief! Great For All This & More! 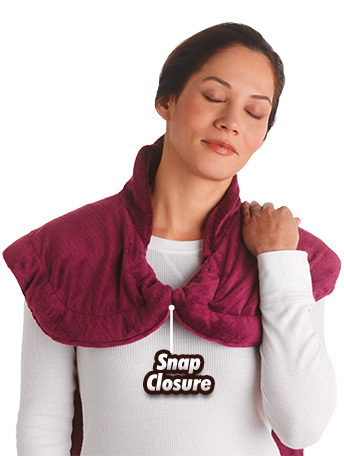 The new and improved neck, shoulder and back heat wrap that quickly soothes away tension and helps ease achy muscles and joints. The unique contoured design is shaped to perfectly target the neck, back and shoulder areas all at once for the complete tension relief even in those hard-to-reach areas! The large wrap, with lightly weighted edges and a new snap closure, ensures full coverage and a perfect custom fit that stays in place. 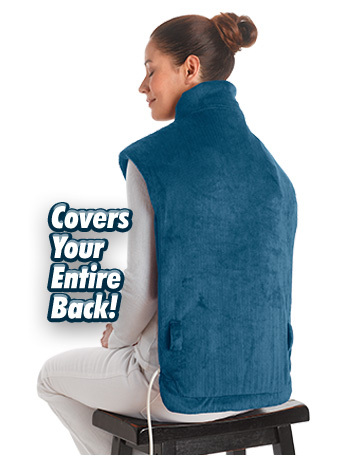 Relief Wrap™ combines innovative heat therapy, relaxing massage, and luxurious micro-plush fabric to surround you with warmth and soothing comfort to melt away tension in minutes! You can unwind and get spa-like relaxation right in the comfort of your own home! The 2 heat settings let you customize your therapy based on the level heat you need to start feeling better and the 4 massage settings get you the perfect level of intensity to maximize results! 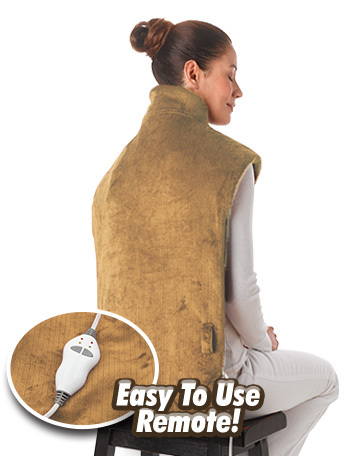 Simply turn on Relief Wrap™ to your desired settings and receive relaxing therapeutic heat and massage directly on the areas you feel of stress and strain for maximum relief! Relief Wrap™ Is Great For All This & More! THIS OFFER IS NOT AVAILABLE IN STORES Fill Out The Form Below or Call 800-537-3159 To Order Your Relief Wrap™ Now! YES! I’d like to double my offer for just a separate $9.99 fee! How many Relief Wrap™'s would you like? Each BOGO order is 2 units of the same color, choose your color below. For a limited time only, we’ll send you 1 Relief Wrap™ for just $39.99 plus $9.99 shipping and handling. PLUS, order right now and we’ll send you a second Relief Wrap™, just pay and a separate $9.99 fee. This offer is covered by our 60-Day Money Back Guarantee. Sales tax will be applied to orders from NV and NJ. A $1 web service fee will be added to each order. Non-continental U.S. orders please add an additional $39.99 shipping surcharge. For customer service, please call 800-680-7820 or email reliefwrap@rephelpdesk.com. To check the status of your order, please click here. ©2019 Relief Wrap™ | The Thermapulse® and Relief Wrap™ trademarks are the exclusive intellectual property of Ontel Products Corp.